This volume contains the proceedings of the NSF-CBMS Regional Conference on Topological and Geometric Methods in QFT, held from July 31–August 4, 2017, at Montana State University in Bozeman, Montana. In recent decades, there has been a movement to axiomatize quantum field theory into a mathematical structure. In a different direction, one can ask to test these axiom systems against physics. Can they be used to rederive known facts about quantum theories or, better yet, be the framework in which to solve open problems? Recently, Freed and Hopkins have provided a solution to a classification problem in condensed matter theory, which is ultimately based on the field theory axioms of Graeme Segal. 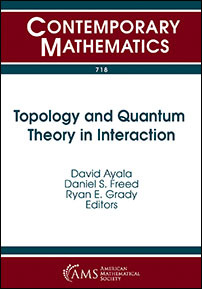 Papers contained in this volume amplify various aspects of the Freed–Hopkins program, develop some category theory, which lies behind the cobordism hypothesis, the major structure theorem for topological field theories, and relate to Costello's approach to perturbative quantum field theory. Two papers on the latter use this framework to recover fundamental results about some physical theories: two-dimensional sigma-models and the bosonic string. Perhaps it is surprising that such sparse axiom systems encode enough structure to prove important results in physics. These successes can be taken as encouragement that the axiom systems are at least on the right track toward articulating what a quantum field theory is. Graduate students and research mathematicians interested in topology, geometry, and mathematical physics.